Easy macro recording and replaying. Is there a better alternative to Auto Macro Recorder? Is Auto Macro Recorder really the best app in Desktop category? Will Auto Macro Recorder work good on macOS 10.13.4? 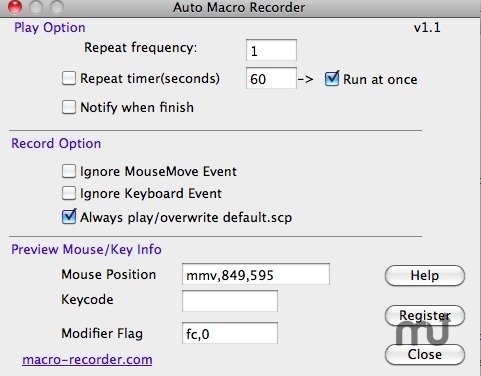 Auto Macro Recorder is an easy-to-use macro recording and replaying tool designed specifically for Mac OS. You can trace mouse move and keyboard strokes by scripts and replay them as you wish without any skills. This tool independently works for any repetitive jobs like auto shutdown, software test, auto website login, etc. Version 1.11: Release notes were unavailable when this listing was updated. Auto Macro Recorder needs a review. Be the first to review this app and get the discussion started! Auto Macro Recorder needs a rating. Be the first to rate this app and get the discussion started!